Rokleen™ is generally safe but avoid contact with eyes and skin. Do not take internally. Gloves and goggles should be used while handling the product. 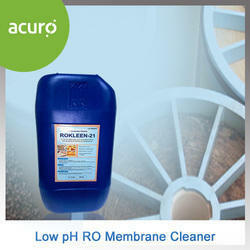 Rokleen™ membrane cleaners are available in 5 kg, 10kg and 25 kg hdpe containers. Cleaning of organic fouling, grease and oil deposits and assist in removal of sulfate deposit. 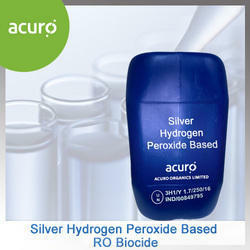 ACURO manufactures an innovative blend of hydrogen peroxide and silver, is an eco-friendly, multi-component oxidising biocide utilising a stable combination of hydrogen peroxide (H2O2) and silver(Ag) ions to form a powerful sanitising solution. This synergistic combination is so effective it creates a biocide twenty times more powerful than that of hydrogen peroxide alone. When adjusting the ph of cleaning solutions or plant feed water always refer to membrane manufacturer's or oem's instructions. Rokleen™ cleaners are used in dilution with potable water that is free of residual chlorine or other oxidizing agents to make the cleaning solution. The cleaning solution must be stirred to avoid localized variations in ph. The cleaning solution is prepared by addition of recommended dosage of product. After adjusting the ph of solution as desired, the cleaning solution is then circulated throughout the system without exceeding pressures, temperatures and flow rates recommended by the membrane manufacturer. Cleaning efficacy can be further improved by heating the cleaning solution and alternately circulating the solution for 15 minutes and then soaking the membranes for 15 minutes. This should be repeated as many times as necessary. Dosage depends on severity of fouling. bed and maintain high service rates. 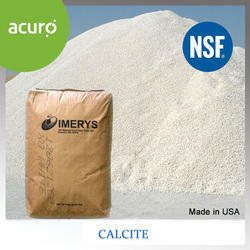 Depending on pH, water chemistry and service ow, the Calcite bed will have to be periodically replenished as the Calcite is depleted. ROBOOST is a high performance alkalinity builder, used to counteract the pH drop by Reverse Osmosis. ROBOOST™ 51 is a blend of chemicals compounds. It counter acts the fall in pH in the permeate water due to removal of salts. 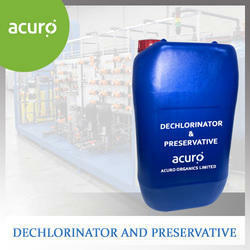 It is a convenient, ready to use formulation for potable applications. 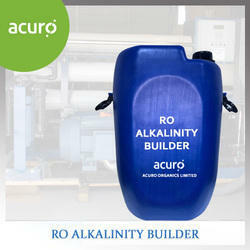 ACURO offers Alkalinity booster for RO outlet water that is a blend of food grade inorganic compounds. It counteracts the fall in pH in the permeate water due to removal of salts. It is a convenient, ready to use formulation for potable applications. 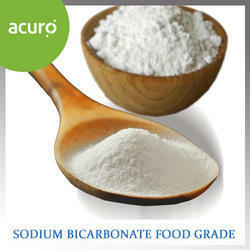 ACURO's Sodium Bicarbonate (Food Grade) is a mineral salt added to reverse osmosis water and make it suitable for the purpose of drinking. ACURO ORGANICS LTD offers a comprehensive range of RO Care and Maintenance chemicals, covering from scale prevention in the membrane to achieve a longer and consistent output and performance from the system. It also reduces shutdown and cleaning.We offer Antiscalants which are versatile and can handle wide range of Hardness, Silica and other foulants along with series of cleaners for removal of scales, iron and other foulants including biofoulants accumulated in the system. We also deal inseries of Biocides for prevention of biofouling in the system, alkalinity booster, dechlorinators and preservators. Reverse Osmosis Biocides - Non-oxidizing, non-ionic biocides can be used either on line or as part of a cleaning program to control biofouling in reverse osmosis (RO) membranes. When used as an on-line treatment, the biocide should be dosed prior to the RO system to control bio-growth in the membranes. Application frequency of any selected biocide will normally depend on biological loading and biofilm growth rate. The program should be used to control differential pressures in the RO plant to reduce cleaning frequency. Application rates and frequency of application (biocide program costs vs. effectiveness) vs. reduction in cleaning frequency, down time, membrane life (operating costs without biocide program) should be balanced to determine the most cost effective biocide dosing frequency. Dosing biocide further back in the pre-treatment will help control bio-growth but will also greatly increase demand and application costs. The main goal of an effective biocide program is to control biofouling in the membranes to an acceptable and cost effective level compared to cleaning program costs (and other associated costs). The two ROC products widely used are 2,2-dibromo-3-nitrilopropionamide (DBNPA) and isothiazolone. These products are fully compatible with polyamide (PA) and cellulose acetate (CA) membranes. We also offer two high performance alternatives, chlorine dioxide and a hydrogen operoxide solution synergised with colloidal silver. 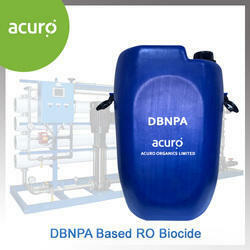 ACURO's DBNPA based Biocide is a fast-acting, non-oxidising, antimicrobial reverse osmosis bio-control formulation with a broad spectrum of activity developed to control the planktonic and sessile microorganisms that may form as biofilms on RO membrane surfaces and in pre-treatment vessels and pipework. ACURO's DBNPA based Biocide is compatible with polyamide RO and NF membranes and can be used with other ROC products as part of a routine cleaning programme or as an on-line treatment programme to reduce the rate of biofouling. Readily degraded to inactive and harmless by-products. Compatible with most membrane types. Peracetic Acid Based Ro Disinfectant is a highly effective oxidizing microbiocide for disinfection of RO/NF/UF membrane. It is safe for potable RO system. 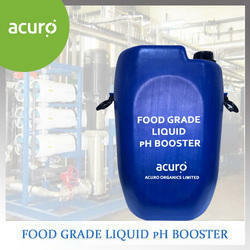 It has high efficacy rate for broad spectrum micro-organisms. Products ro membrane from the potential oxidation which can be caused by free chlorine. 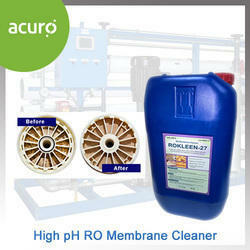 Rodechlor 63 can be used to protect membranes in storage. 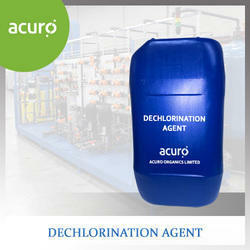 Enhances the output water qualityRapid reaction with chlorine. Protects polyamide membranes from degradation.Safe and simple to use. 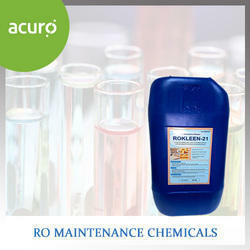 Looking for RO Maintainence Chemicals ?